The table below shows the chronology of its lengthy run. 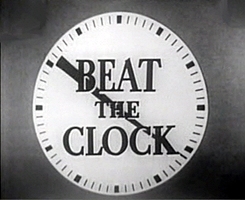 There was no opening theme, the opening shot was of the clock with the ticking heard in the background. 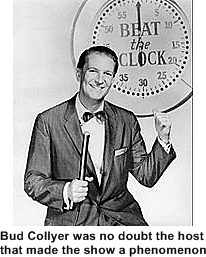 After a short while the announcer would say and now here’s America’s “number one clockwatcher”, Bud Collyer. The show was simple. Couples performed stunts and had to complete them within a time limit (hence the clock!). Hyper Bud cheered them on at every step or in most cases, mis-step. Prizes were awarded for completing the stunt on time and then the contestant could go on to compete for a bonus prize. The contestants would come from all walks of life but they were usually married or a couple, middle aged and nicely dressed which pretty well described everyone on television in the fifties. The men wore suits the ladies a dress and when they had children with them they too were nicely dressed and above all, polite. Bud Collyer loved the reactions that he could pull out of kids so they were a fairly common occurrence on the show. There were basically two types of stunts. The first type required agility, balance, good aim and usually for the contestant to look ridiculous while performing them. 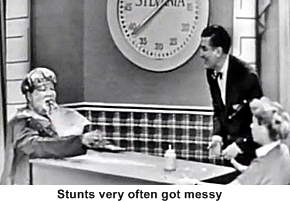 The second type of stunt involved shaving cream, soaking water, whipped cream, pies or anything else that a person could be slimed with and definitely made the contestant look preposterous. Husbands took the brunt of the gags but wives weren’t completely safe either, receiving their fair share some of the time. 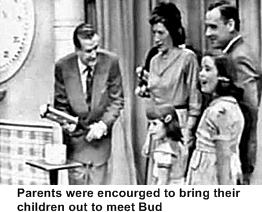 The show was loved by all, did well in the ratings and was a staple of 1950s tv viewing. 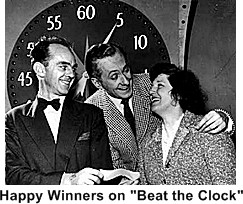 It switched to daytime for a while from 1958-’60 at first it was still carried by CBS but shortly after the move to daytime they let ABC have the show. ABC dropped it in 1961 and it wasn’t remade until 1969.